Whenever you are looking for quality help with phone calls, you always think about spending some money on that. You don’t have to bother about spending money anymore especially when you have an online source over there. Through a simple log on details, you can catch up with four of your friends internationally on the same day without wasting any time. You can either call one person four times daily or just look for each friend at a time. For that, you just have to catch up with the right team for help. There is a reputed online source, which makes connection easier without burning a hole in your pocket. Calling internationally might take a lot of money from your pocket. A simple minute can ask for so many pennies that it becomes hard to contact anyone for help. But now, you can always get along with the free calling service, available within the pre-set budget plans. If you are currently eyeing for top quality experts, you have to get along with the best team for help. They are more than happy to offer help right on time, and without even letting you spend a single penny from your side. 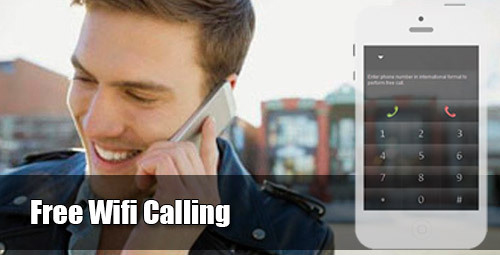 You can get along with the free wifi calling service on time. Nowadays, you will come across Wi Fi usability on a daily basis. Whether at your home or office, Wi Fi connection is important. So now, take help of this Wi Fi connectivity for catching up with your family or friends staying miles away from you. Stronger Wi Fi connection helps in matching with the working ability of the software and it will help you big time. In case, you are eyeing for calling someone without spending anything, you just need this Wi Fi connection and a host device for the same. People might have a misconception that free wifi calling is only associated with the basic host devices. But in reality, this is not the matter. Nowadays, smartphones are taking over general PCs and laptops. There are internet connections in smartphones too and even those devices can catch up with the surrounding Wi Fi areas. So, even while you are on the go, you can log on from your smartphone and have a direct chat with the person in question. This can work big time for you, and without even restricting your movements to only in front of your PC. For a change, you can carry your laptops too. Remember that complex designs of online software won’t work to attract customers. The reliable software developers are well-aware of this situation and would like to work on easy design of the website, as well. The free wifi calling service comes handy with easy website designs. There is a design of a smartphone, which people is generally aware of. There are number pads along with a green and red button. So, you just have to enter the number and press green button for calling, just like with their standard smartphones. If you are trying to call through this particular free wifi calling service, there are some points to consider first. Always remember that you have to call using the international format. If you are not aware of the format, you can Google for the right international phone format. Moreover, you have the liberty to make four calls a day for a particular time and not more than that. The features are changing and soon enough the software developers might come across ways to make more than four calls. But for the time being, it is restricted to phone calls. For clearer audio, make sure to use headphones with the host device, whether smartphone or PC. You can use the speaker for talking and the hearing aids for hearing the person from the other side of the phone line. The entire procedure of IEvaphone is not going to take much from your side as the navigation is rather simple. Even if you have less amount in hand, still you don’t have to bother as these calls are free of charge.